Have you ever had one of those days,where you just KNOW you were supposed to remember something, yet, for the life of you, you can't? It is totally that day for me. I attribute it to the fact my husband took the whole week off of work. In fact, he always takes our anniversary off of work, and my birthday and his own birthday. Since we just planned to stay home and chill, he came up with stuffing meatballs. He was devastated to find out he indeed was not the inventor of the stuffed meatball! But we put together this dish together, and we had a great time. I gave you the ingredients for each part, instead of all together and dividing them. Make sure to go down the entire recipe for what you will need. This freezes beautifully, it can be made a day or 2 in advance, and it gets better the longer you reheat leftovers, just like real spaghetti, in my opinion! I used jarred sauce. Don't even make that "face", sometimes, I do it, I own it, and I do it proudly! If you have homemade, or want to make your own for this, go ahead. I just felt like the meatballs were the star, so the sauce wasn't going to get all my time and effort! Combine ALL ingredients EXCEPT mozz cheese, and roll into 24 meatballs. They will be big! When you roll a meatball, stick a small cube of mozz in the center and completely seal it back up. If you do not take time to make sure they are sealed, the cheese WILL leak out and the fun stops there. HA! I used a little water on my hands to make sure they were sealed good! In a skillet with olive or vegetable oil, brown the meatballs on all sides. It is important to brown them to seal the cheese in. You aren't cooking them all the way through here, just browning them. When you are done set them aside. Lay it in the bottom of a greased 9x13 pan. It will act as your "crust". Lay the rest of your leftover mozzarella on top of the pasta. You can see I just pulled pieces apart with mine but if you cube it all just lay them over. This is delicious, and easy to change to suit your liking. Do you like ricotta? Put that on top of the marinara too! It was the original plan but since my husband knows I don't like it, he didn't want me to put it on. This will freeze like a dream and when you are still eating it 2 days later, it will be even better than when you first made it! I promise! 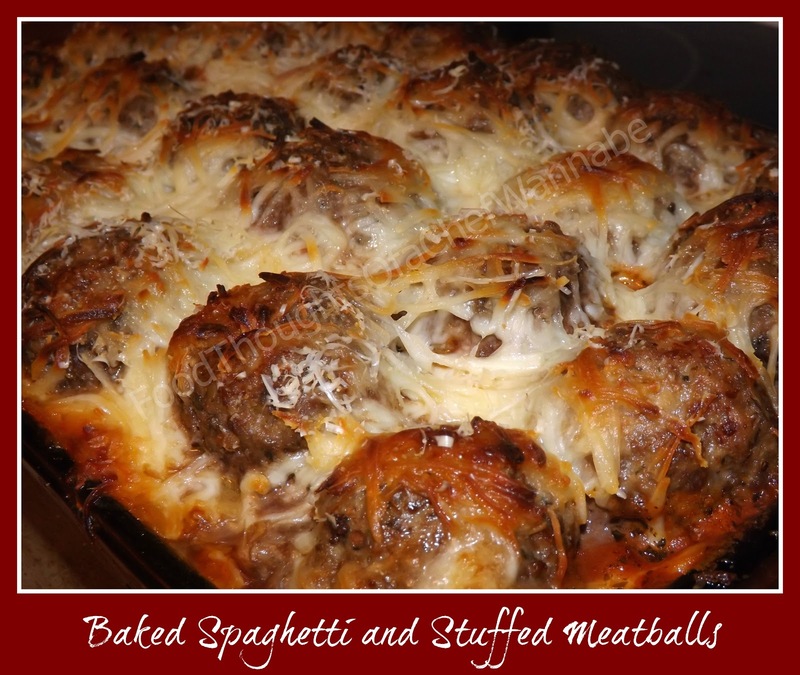 omigosh this looks delicious and is probably the easiest meatball recipe I've seen. Totally going to try this! Hey Mom! I have a new favorite! Mom? Hmmm.....is this who I think it is? I just totally drooled Chris. Printed this up and shared on my FB page. Yummmmmy!!! Instead of using water to help roll meatballs, dip them in Marsala wine and roll. It adds a nice flavor. I'm going to try this recipe but, without beef and the mozzarella cheese. I'm starting my home restaurant and this will be a part of the menu. This recipe sounds fantastic! Making it Sunday. This sounds great! Can I make it the day before I bake it or no because of the eggs? Hi Michele! I don't think I would recommend making this one ahead. You could certainly cook the pasta and make the meatballs ahead but I don't think I would recommend putting it all together ahead of time (before baking) Thanks for reading! there are many breakfast casserole recipes that allow you to make the day before and refrigerate before cooking that include eggs. I see no reason this recipe wouldn't work made the day before. WOW looks yummy, I'm on it..
A friend just posted this recipe on Facebook & it caught my eye because I love Italian & am all about the one dish meal. Do you think ziti or other "short" pasta would work ok (not a "long" pasta fan)? Bake uncovered, right? By "regular size" canned tomatoes you mean the 12-15 oz size, I gather & "gussied" is spiced-up? Hello Deborah! Yes I think short pasta will be just fine. Yes bake Uncovered and you are correct on the tomatoes and gussied up is in fact spiced up! Thanks for asking and I hope you love it as much as we do! Thanks for reading! I am making it right now!! It looking & smelling wonderful in the oven... Taking it to a dinner tomorrow night. Let me know how you like it! Thanks for stopping by and leaving a comment! If I wasn't so stuffed up I bet I could smell it through the computer! HA! ENJOY IT!